The 16-year-old from Eastleigh finished runner-up in the first two legs but collected the winner’s trophy and £100 prize money in the sixth event in Bournemouth. Benzey, who leads the EASB Regional Junior Tour South and won the European Under-17 Open in Malta last month, defeated Jamie Wilson 3-1 in the final at Greenbaize Snooker Club. He said: “I’ve been playing really well in practice but just struggling on match tables. Steven Hughes (Chandler’s Ford) beat Wilson (Havant) en route to topping his round-robin group but lost 3-1 to Benzey in the last-four. Ryan Hughes, also from Chandler’s Ford but no relation, beat Benzey en route to topping his round-robin group but lost 3-0 to Wilson in the last-four. Reflecting on that defeat by Hughes, Benzey added: “I really struggled in that match. I couldn’t get going at all. Wilson recorded the day’s highest break of 86 in his third group-stage match against Londoner Ronnie Sullivan. The top two in the rankings both made group-stage exits. Home player Bradley Cowdroy remains one point clear of Oliver Sykes (Chandler’s Ford). Wilson is four points further back in third and seven ahead of fourth-placed Benzey. Fareham Snooker Club hosts the seventh of the ten legs on Sunday, February 24. Jamie Wilson: 86, 70, 65, 45. Connor Benzey: 63, 63, 57. ROUND-ROBIN GROUP A: 1st, Ryan Hughes (Chandlers Ford SC); 2nd, Connor Benzey (Chandlers Ford SC); 3rd, Bradley Cowdroy (Greenbaize, Bournemouth); 4th, Elliott Weston (Top Spot, Havant); 5th, Riccardo Drayton (Chandlers Ford SC). ROUND-ROBIN GROUP B: 1st, Steven Hughes (Chandlers Ford SC); 2nd, Jamie Wilson (Waterlooville Sports Bar); 3rd, Oliver Sykes (Chandlers Ford SC); 4th, Ronnie Sullivan (Frames, Coulsdon); 5th, Chloe White (Waterlooville Sports Bar). SEMI-FINALS (15 points): Wilson 3-0 R Hughes, Benzey 3-1 S Hughes. FINAL (£100/£25, 25/18 points): Benzey 3-1 Wilson. 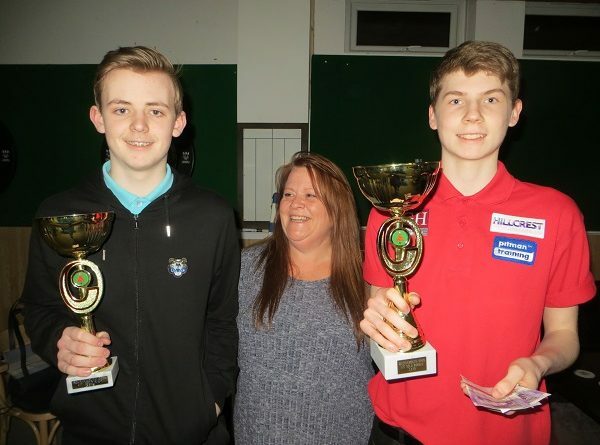 From left: Jamie Wilson, Greenbaize club owner and event sponsor Debbie Ealy, Connor Benzey.